Which iPhone is set to be released at WWDC 09? The iPhone... what's happening next? We're just hours away from Apple's WWDC keynote speech, and the rumour mill over what kind of iPhone will be released is reaching fever pitch. It's pretty easy to see that a new Apple handset is on its way, but despite some high profile leaks, we're still no closer to understanding what's going to be brought out by Phil Schiller. 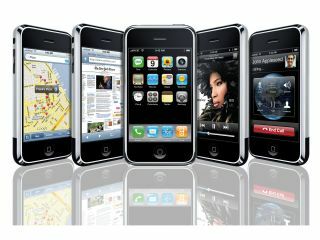 While there might be a few billion rumours doing the rounds at the moment regarding what's going to be announced on the new iPhone, one of the most vociferous is the notion it will come with an expanded memory set, from a 4GB iPhone 3G for cheap up to a 32GB new version, with 8GB and 16GB thrown in for good measure. It would be a real shock if we see an iPhone launched in the basic 8GB and 16GB versions again, especially as we've seen some decent information that a 4GB option is on the way and presentation slides of a 4GB version for $99 (around £65). You know Apple, never one to sit back and not make any changes. This year it's going to be big in terms of alteration. We mean BIG. No, not an iPhone Nano. Nor a flip iPhone. Nor a transparent.... look, it's a new matte black cover. What do you mean that's rubbish? We've seen leaked photos of the new iPhone in the same size and shape as before, but this time with a matte black cover. So it's pretty likely. While it might not sound exciting, we're talking black all over, so even the chrome rim has gone. Not only that, but it means you probably won't be dropping your pride and joy all over the place any more... see, not that bad is it? There's a lot of talk that the new iPhone will be announced as the 'fastest iPhone ever' with chat that a processor of up to 800MHz will be stuffed under the cover, with around 256MB RAM to keep up. It certainly makes a lot of sense when you consider that a new iPhone will be rocking the new iPhone 3.0 OS that it would need some more grunt under the hood, and technology doesn't sit still... staying where you are in mobile phone world is moving backwards and all that. However, we don't think that the processor speed will double, just head slightly north from 400MHZ to around 600MHz.... you know, to keep pace with those damn Palm boys and all that. Oh, the fun of the iPhone. One of its most idiosyncratic features is the fact it has a camera that, in mobile phone terms, is as good as employing a small child to stand near you with crayon and a pad and drawing what's in front of you when you press a camera button on the device. But never fear, as the world is starting to believe that the new iPhone will come with an upgraded camera, and some are getting so giddy they're believing it will have a video camera AND a flash, like some sort of Apple ambassador walking round with a pyramid of iPhones and a lady in a posh frock claiming that he is spoiling them. This was a tricky one, because it's probably half right. While we would love to believe the world is about to get an iPhone with a fixed camera, there hasn't been a sniff to suggest a flash will be anywhere near the mix. But thankfully there's a lot to suggest that it will be coming with some video recording software, and who knows, even a better camera and an editing suite too.